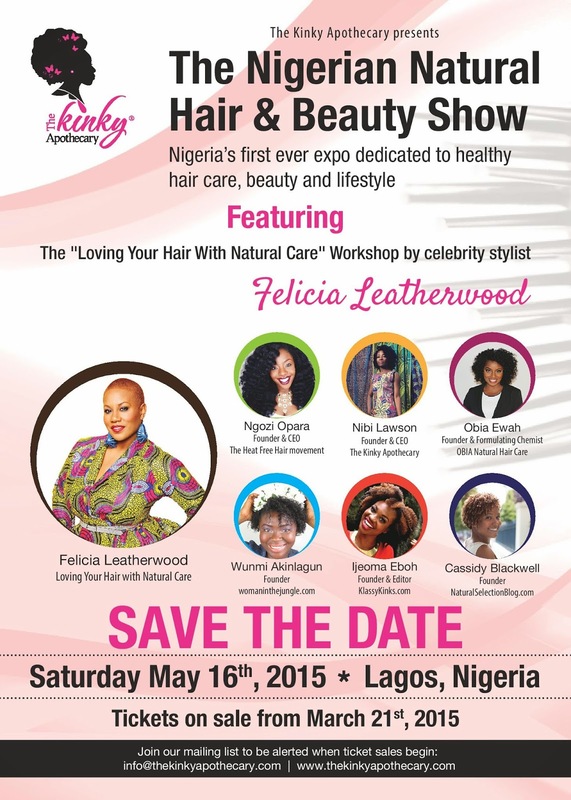 Update: The Nigerian Natural Hair & Beauty Show - Early Bird tickets now available! Since Felicia Leatherwood's last visit to Lagos, a frequent question we've received has been when is the hair whisperer and stylist to stars such as Jill Scott, Teyonah Parris and Will Smith bringing her workshop back? Well, we finally have an answer for you! Felicia returns on May 16th, and this time she's not alone! She'll be joined by Ngozi Opara, founder of the Heat Free Hair movement, Wunmi Akinlagun of Woman In The Jungle, Obia Ewah, the creator of Obia Natural Haircare products, Cassidy of Natural Selection Blog, and our darling Ijeoma, aka Klassy Kinks returns! Early bird tickets now on sale via Afritickets. Click here to purchase! Sounds like an awesome, event.